These plates are used on vehicles operated in conjunction with farming activities. The farm must have gross annual sales of at least $2500, and the plates cannot be used on vehicles transporting goods for hire. 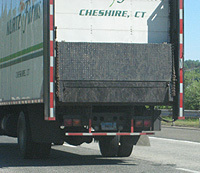 Use of Farm plates on trucks transporting the farm’s own goods to market is permitted, however. In the late 1950s and early 1960s, date tabs were used to designate the year. However, I have seen a white on green farm plate with a ’62’ embossed year. When the graphic ‘blue fade’ plates were introduced, there were 2 varieties of farm plates – some had blue numbers, and some had red. It appears that a number of re-made plates in the “F” types (Factory, Farm, Fire Apparatus) were mistakenly manufactured with blue instead of red numbers. This plate is actually white on a deep, dark green. I’m not sure whether these plates were supposed to be used through 1968, or whether the owner put the stickers from the plate on the right on his old plates above. Also note the odd position of the dot – seems like right after they started making the 5-number plates they needed to get a feel for where the dot belonged.